April 24, 2016, 8:20 a.m.
After big wins in New York, a new YouGov/CBS News Battleground Tracker finds Hillary Clinton and Donald Trump poised to grow their delegate leads when voters in Pennsylvania and Indiana head to the polls. 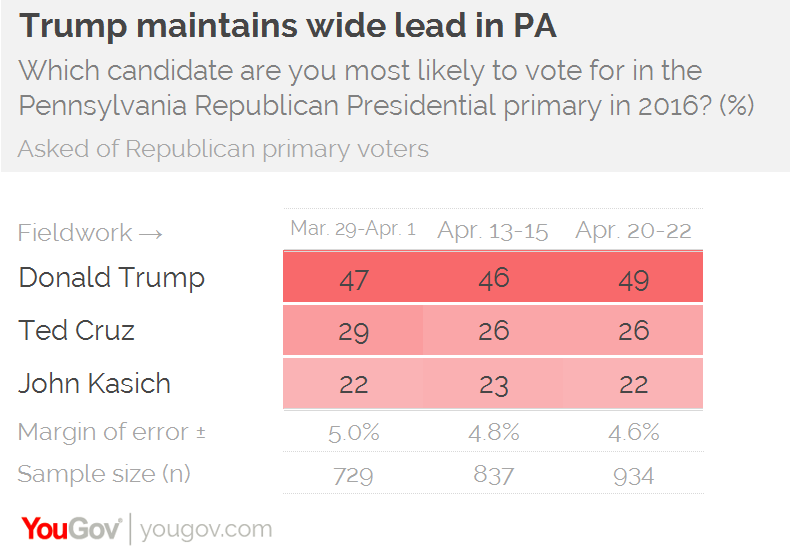 In Pennsylvania, 49% of likely Republican primary voters say they are likely to vote for Donald Trump, putting him comfortably ahead of Ted Cruz with 26% and John Kasich with 22%. Positive coverage following Trump’s dominating 35-point win in New York may be making voters more optimistic about the Republican frontrunner, who now holds a nearly 300-delegate lead over Ted Cruz. By 33% to 25% Republicans in Pennsylvania say their views of Trump have gotten better rather than worse. That +8 margin might not sound too impressive, but it compares to +1 for Kasich and -19 for Ted Cruz. There has, however, only been a modest improvement in Trump’s overall numbers. A poll conducted a week ago found Trump with 46% support, and a poll conducted at the end of March showed him at 47%. The changes are within the poll&apos;s margin of error, however. The Pennsylvania primary election is held on April 26th. Among likely Democratic voters, Hillary Clinton holds an 8-point lead over Bernie Sanders, 51% to 43%. This points to a closer race than in neighboring New York, where Clinton won by 16 points, but her underlying strengths with certain groups remain. While Sanders wins “very liberal” voters by 25 points, Clinton wins other liberals and moderates, who make up the majority of the state’s likely Democratic voters. Clinton also maintains a 30-point edge among non-white voters and significant advantages among key groups like older voters and women. Like the New York primary, Pennsylvania is a "closed primary", meaning only voters registered with the Democratic Party can participate in the Democratic primary election. This benefits Clinton, who does poorly with independent voters. A win in Pennsylvania, with 210 delegates at stake, would expand Clinton’s already daunting lead of nearly 250 pledged delegates. 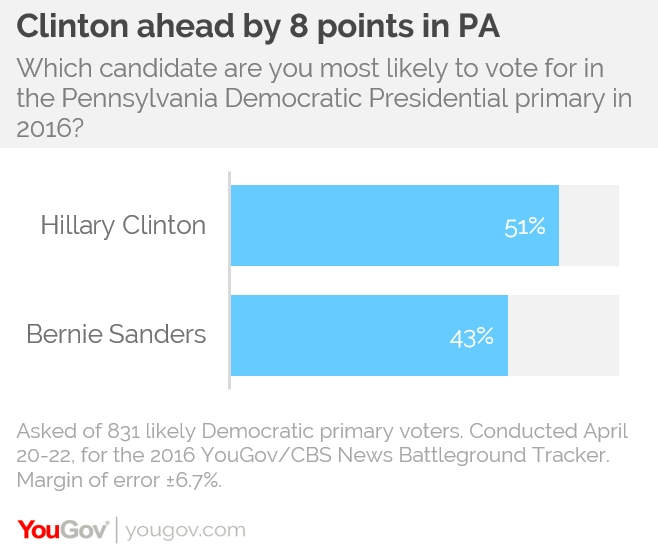 Yet Clinton is clearly already the presumptive nominee in the eyes of Pennsylvania Democratic voters: 79% believe it is “very likely” she will win the nomination, compared to just 10% for Sanders. Even among Sanders supporters, only 17% believe he is very likely to be the nominee. 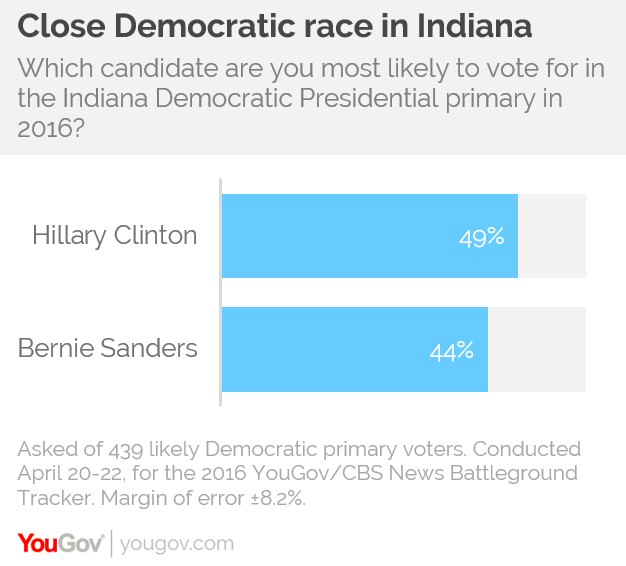 Indiana is a similar story, but both races are tighter. 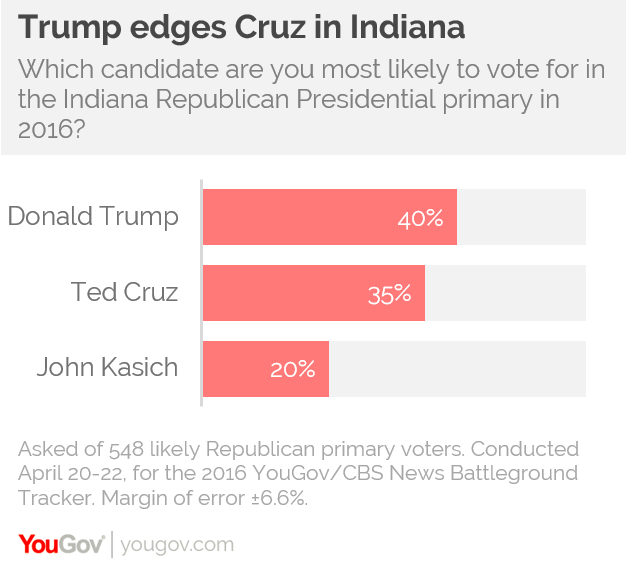 Donald Trump leads Ted Cruz by only 5 points, 40% to 35%, with John Kasich trailing at 20%. Cruz benefits from more favorable demographics in Indiana than Pennsylvania, but he also performs better there among the demographics that have provided his base in the past, including evangelicals, Tea Party supporters and very conservative voters. The Indiana primary eleciton is held on May 3. Hillary Clinton also leads Bernie Sanders by 5, 49% to 44%. Sanders benefits from a stronger performance among white voters as well as a smaller gender gap. Voters there are more likely to say their opinions of Sanders are improving, and the state represents a rare opportunity for the Vermont senator before the primary moves West again, to more favorable territory for him. Indiana also allows unaffiliated and independent voters to participate in presidential primaries, which should benefit Sanders. The YouGov/CBS News 2016 Battleground Tracker is based on surveys of registered voters in Indiana and Pennsylvania. 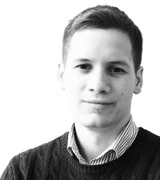 See a more detailed description of the methodology used here.